The NY Giants are off to a tough start and Eli Manning must be looking for something to change the team's luck so perhaps the fundraiser this evening with Mayor Zimmer is the elixir. with his wife Abby for a Mayor Zimmer fundraiser at the Madison. Now Da Horsey doesn't believe in superstitious trivializing of the grid iron with politics and since MSV is not a flack, nor paid by Hoboken politicos, Hoboken political families, third party firms or a Mati Hari; let's call it a celebration of the community with a national celebrity who cares about his family and home. Update 8:20 - A report came in minutes ago people were still arriving. The event is officially sold out. 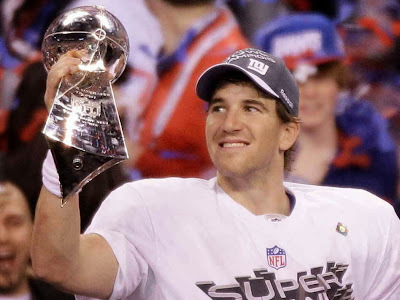 Thank you very much Eli Manning! Grist for the Mill: Pupie says, "Vote for Pupie"